With the backdrop of unanimous decision of IBAF Congress for baseball to work together with Softball for Olympic reinstatement on the day before, the 2nd Olympic Baseball Players’ Clinic at Tokyo Gas Company’s Omori Ground on Sunday, December 4, 2011. 200 young players of Under 12 learned baseball from 20 former Japanese Olympic Baseball Players including Michio Ogasawara, 3rd baseman of Tokyo Yomiuri Giants (Atlanta). 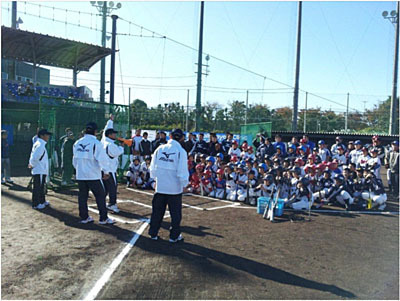 The 1st Clinic was held on December 4, 2010 at Toyota Ball Park in Aichi.